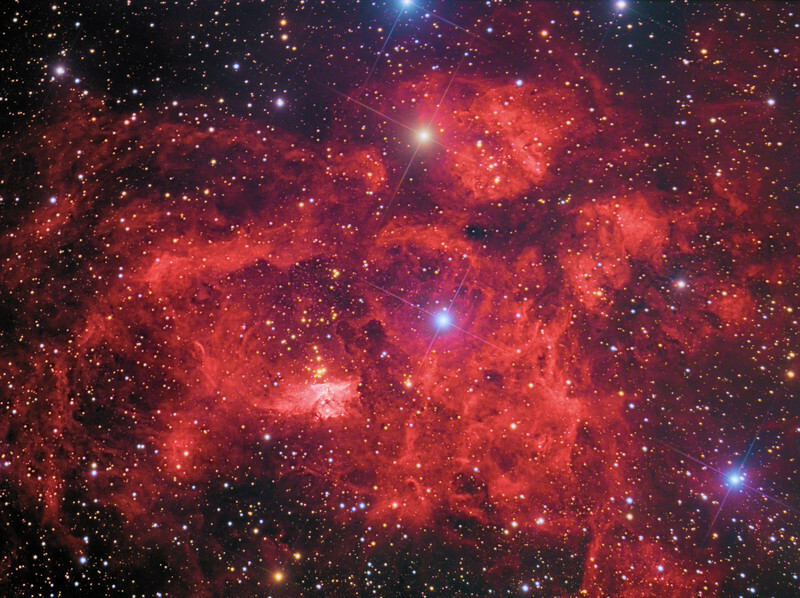 The large nebula NGC 6357, also known as the 'Lobster' or 'War and Peace' nebula appears intensely red, a striking contrast to most emission nebulae which are somewhat more magenta. At the center of the nebula lies a small star cluster Pismis 24 containing some of the heaviest stars known. The intense ultraviolet radiation from these stars is slowly eroding the surrounding gas and dust away and shaping the delicate structures visible throughout the region. The heaviest of these stars, designated Pismis 24-1, was long thought to weigh some 200 to 300 solar masses, well in excess of the theoretical upper mass limit of about 150 solar masses for an individual star. But in 2006 high-resolution images taken with the Hubble Space Telescope showed that Pismis 24-1 is really two stars orbiting one another. Further to this, ground-based spectroscopic studies have revealed one of the stars to be a tight binary. Still, these three stars are among the heaviest known. The cluster and nebula lies 8000 light years away in the constellation Scorpius. Link: High-resolution comparison of Pismis 24 with images from La Silla and the Hubble Space Telescope.